The Which Greek Island Kos beach guide offers an in depth look at some of the best beaches in Kos. North coast, south coast, east or west, wherever you’re staying we’ll help you find the best beach for your needs. Some of the most popular tourist beaches are those on the north coast close to the main tourist villages, so Tigaki beach, Marmari beach and Mastichari beach as well as Paradise beach on the south coast. On all of these you’ll find food and drink available from beach side tavernas as well as water sports to keep everyone entertained. They’re popular with holiday makers for a reason. If you want to get away from the crowds then stay away from the beaches above and head down towards Kefalos where you’ll find beaches like Kamari, Kefalos, Magic and Limnionas. All of which have some facilities but don’t attract the tourists as much as the others on the island. There’s no real stunning looking beaches like you find on other islands but Camel beach has a picturesque charm about the way it’s cut into the rock formations on either side. Another option is Agios Stefanos beach as it has views out to Kastri islet and the Basilica of Agios Stefanos overlooks the beach so it’s a special place to spend a few hours. Kos has loads of sandy beaches, in fact, most of the islands beaches are sandy, it’s one of the reasons Kos is so popular. The best sandy beaches are probably those on the south coast around Paradise beach or those on the north coast up by Tigaki beach. For those that don’t like getting covered in sand or simply prefer a pebble beach head for the east coast, this is where you’ll find the shingle and pebble beach of Psalidi and the hot springs pebble beach of Thermes. Agios Fokas is also out that way and has grey sand, shingle and pebbles so could be an option too. 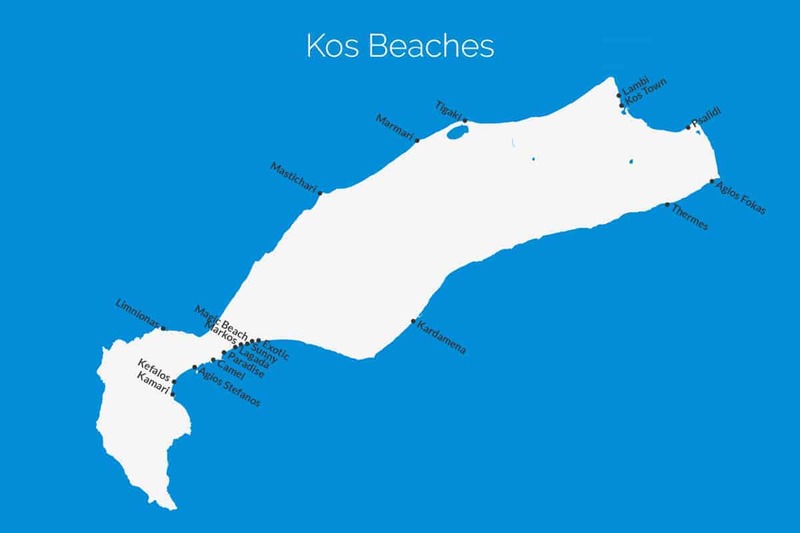 Our full Kos beach guide below shows all 19 of the main beaches on the island. If you already have an idea of the beaches you want to visit then you can click on the headings and be taken to a page that gives you the details about that beach, alternatively use the filters to get a list of beaches that would be ideal for your needs. You may find when using the filters that you click on too many and get no results, if that happens simply click again to remove some or click All to start from scratch. The main beach of Kos town is actually a continuation of Lambi beach as it heads south into the capital and approaches the harbour. If you’re going to Kos or thinking about going then why not tell your friends about it using the links below? You never know what insights or advice they may have to offer. Alternatively you could just show off about what a great trip you have planned. We want Which Greek Island to be as accurate and informative as possible, so, if you notice anything wrong with the Kos beach guide or any other page please let us know. There may from time to time be places on an island that we’ve missed completely so if you see a town, village, beach or attraction that’s not listed then please use the contact us page to let us know and we’ll get it added to the site. We’re also on the lookout for great photos to show people what the places we’re describing are like. If you have photos from any of the beaches in Kos or from any of other island on the site then we’d love to see them, simply click the button below to go to the photo upload page. Thanks.